Travels with a Tin Donkey: Better than "Cash for Clunkers"
Retro is in. Brägel has also realized this–and turned the trend into hard cash. In Autumn you always tell yourself that before Christmas comes it is time to get rid of all the junk that should have been thrown out years ago, stuff you never had the heart to part with as you thought that sooner or later you might find a use for it. Normally, nobody ever gets around to doing this and so the average German basement is stuffed with twenty bags of baby clothing, IKEA bookcases with crooked shelves, mouldy kitchen cutting boards, a bidet inherited from the neighbour, a million plastic throwaway flower pots from the garden centre, along with ancient clapped-out power lawnmowers. Piled underneath are old television sets and cages or baskets for long-vanished pets. It sounded like a good idea, and after getting the approval of the Club President (who asked if he could get rid of his wife at the bazaar), we sealed the project with a Hefeweizen and began to collect the treasures in the clubhouse basement. After two weeks it looked like a scrapyard. It also smelled a bit as Brägel had brought a bunch of jerseys, the kind that people wore back when winners of the Tour de France had names like Bernard Hinault or Laurent Fignon. It all ended being an unbearable pile of gruesome trash, or so we thought. But the bazaar turned into a fantastic success as some pretty close to unbelievable scenes played out. An old man bought a half-filled and nearly unopenable can of Campagnolo grease for TWENTY Euros simply because you can’t get it anymore. Old Hans had wanted only one Euro for it but the bidding shot up as three interested parties fought for it. Another left the clubhouse in tears of joy, carrying out two white leather toe straps for prehistoric quill pedals. The good man had to be restrained from kissing the Club President--he had been searching for these kind of straps for years. My old Modolo brakes, which never really stopped that well, brought noises of ecstasy from a bazaar visitor and I took the opportunity to quickly add a “0" behind the “5" on the price tag, and the madman actually gave me a fifty for the old crap. Brägel himself pulled in a small fortune with a set of white rubber hoods and the matching old Super Record brake levers. At the end, he even found a buyer for an old Banesto water bottle that inside looked like a science experiment gone wrong. The buyer claimed that the bottle would have a place of honour in his living room cabinet, next to the Indurain poster. By evening, everything except the wife of the Club President had been snatched up, and we felt like the inventors of the “Cash for Clunkers” program. All that was left over were a pair of wheels and an opened tube of chamois cream belonging to Brägel. “I can’t understand why nobody wanted it,” he said, but although we all had an idea why we didn’t say anything. In any event, we were all pretty happy with the results and we ended the day with the knowledge that there were bicycle freaks out there even worse than we were. Of course, this success gave rise to another problem. Now knowing that for every piece of old junk there was an enchanted buyer to be found, in future we would throw out of even less stuff that we do now. Could it be that this old bottle cage comes from a limited edition and might be a collector’s piece in 20 years? Somebody even was thrilled to buy Brägel’s primordial Peugeot frame, something even he was hesitant to bring to the bazaar. Perhaps in the future there could even be a handy woman who collected wrecks who might take Old Hans home as a restoration project. Since all Germany seems in retro-fever, all things are possible. We dug around some more in our basements and garages and a few weeks later brought a few things to show off at the Stammtisch, just in case anyone was interested. There were a few links from a 1985 Shimano chain, some bicycle cleaning fluid (which smelled so strongly that a few drops would probably contaminate a million litres of clean water), clipless pedals the size of a piece of toast, a saddlebag with the Team Telekom logo, and one of the first bike helmets, looking like a chamber pot with slits. 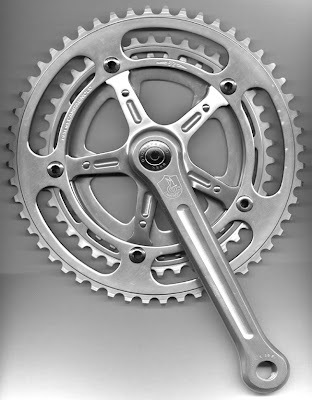 Also admirable was the VDO speedometer that required at least 20 watts of power to function, or a set of the first version of Campagnolo’s Shamal rims, that would fill up with water until you drilled a hole in them. All of these are totally retro, and to be found at our 2010 club bazaar.